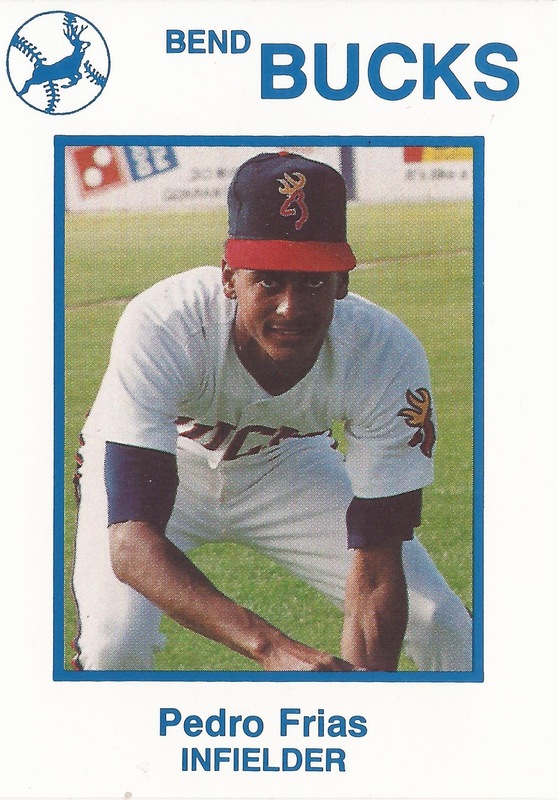 Pedro Frias learned from his initial opportunities at bat in this June 1990 game for short-season Bend, and it helped result in a Bend victory, according to The Bend Bulletin. Frias knocked a two-run single in the seventh inning to hand Bend a lead it wouldn't relinquish, The Bulletin wrote. "My first two times up, they started me with a curve," Frias told The Bulletin through an interpreter. "I decided I'd let that go and look for a fastball." Frias took what he learned at Bend on to time over the next two seasons at single-A Clinton and high-A San Jose. Frias, however, never learned enough to make AA. Frias' career began in 1989, signed by the Giants as a free agent out of his native Dominican Republic. Frias is also known as Pepe Frias. Frias started with the Giants at rookie Pocatello. The infielder got into 58 games and hit .196. He popped out to end a July game. He moved to Bend for 1990. He started the year in a June working on his glove while he went 3 for 3. He and his teammate helped on an early double play to end a threat, The Bulletin wrote, but the two misplayed one late to lead to the loss. "There was some miscommunication, but that's to be expected this early," Bend manager Mike Bubalo told The Bulletin afterward of the Frias-involved misplay. "Those things will come. Those kids have the tools." Frias played 1991 between single-A Clinton and short-season Everett. He hit a playoff RBI double and a home run for Clinton. He then returned briefly in 1992 at high-A San Jose. He got into eight games there to end his career.